A twitter friend tweeted that she made a great Pastitsio casserole for dinner. 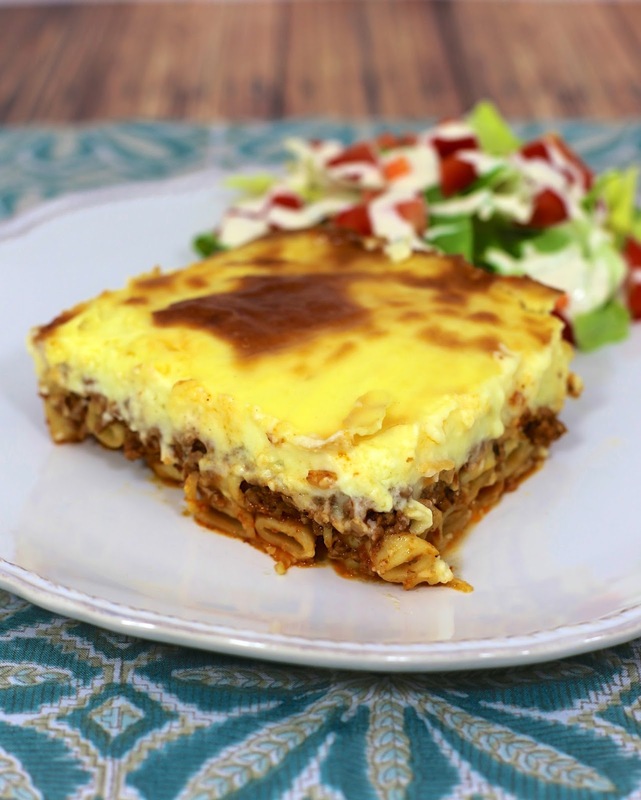 I have never tried Pastitsio, so I was intrigued. I looked over several recipes and decided to give it a try. There are three components to this dish - pasta, meat sauce and béchamel sauce. This takes a little bit of work, but it is SOOO worth it! The most unique thing about this dish, to me, is the cinnamon in the meat sauce. It gives the dish a real distinct flavor. I made this dish all at one time. It takes a while. It is something I would make on a weekend when I had more time. Next time I might make this on a Sunday and refrigerate for dinner on Monday night. Preheat oven to 350. Lightly grease a 9x13-inch pan. Set aside. Toss hot pasta with 3 Tbsp of butter and 1/2 cup Parmesan cheese. Pour into prepared pan. Cook ground beef, onion and garlic in a large skillet over medium-high heat. Drain. Stir in tomato sauce, 3/4 tsp salt, cinnamon and pepper. Spread over pasta in prepared pan. Melt 1/2 cup butter in a heavy saucepan over low heat. Whisk in flour. Cook, whisking constantly, 1 minute. Whisk in milk. Cook over medium heat, whisking constantly, until thick and bubbly. Stir in remaining 1/4 tsp salt. Remove from heat. Whisk eggs until thick and pale. Whisk about 1 cup of milk mixture into eggs. Pour into remaining milk mixture and whisk constantly until combined. Pour milk mixture over pasta sauce. Top with remaining Parmesan cheese. Bake for 1 hour or until golden brow. Looks fabulous. Does that topping have the consistency of custardish or cheesy or is it more firm.? Interesting. The béchamel is soft on top. I went to the Greek festival in Richmond, VA many years ago when I lived there, and purchased a cookbook that was put together by the ladies of the church. 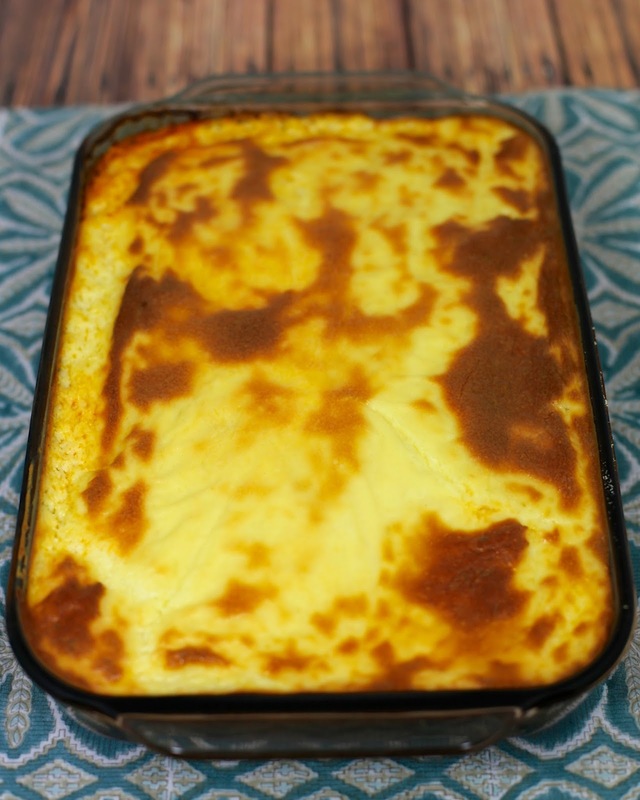 There are a handful of recipes that I make from that book, and one of them is pastitsio. The whole family LOVES it!! To answer babs' question, the bechamel topping (in the recipe I make anyway) is custardish--it's very soft. Hi Emily! I live in Richmond (used to live in the apartments directly adjacent to the church) and our Greek Festival is still going strong! I've also enjoyed their pastitsio. I've never heard of this but it sure looks good. Great recipe, but since I loathe cinammon in tomato sauce, I added basil & oregano, and it was delicious. We have a spagehtti sauce recipe with cinnamon that my sister-in-law's father got from an Itailian family. It is really good. This is my favorite Greek dish! Yum! Oh I love patitsio. Yum! Nabeel's has the best pastisio! I'm excited to have a recipe to make it at home!